PlastiComp’s Material Processing Guide is intended to be a useful resource for people who have the responsibility to set up and/or operate injection molding machines producing parts made from long fiber reinforced materials. In preparing this manufacturing pocket reference, industry specialists with decades of experience have focused on delivering the most helpful information they have gathered regarding the molding of long fiber reinforced thermoplastic materials. 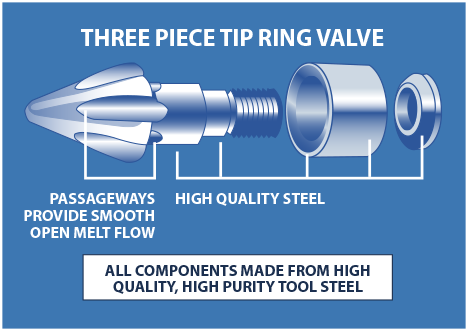 We recognize that there are a variety of processing manuals available, but we’ve learned that there is widespread interest in a compact, convenient and easy to use document that can be carried in a pocket, briefcase or posted at a molding machine location. Simply stated, reinforced thermoplastic materials identified as being “long fiber” are those in which the individual reinforcing fibers are of uniform length and are in parallel alignment with each other. In other words, the individual reinforcing fibers are aligned with respect to each other, and are exactly as long (usually 1/2 inch or 12 mm) as the pellet. In contrast, short fiber reinforced thermoplastic materials contain reinforcing fibers of various short lengths that are randomly orientated in the resin/pellet. Injection molded parts manufactured with long fiber reinforced thermoplastic materials can deliver superior, predictable mechanical performance compared to short fiber reinforced thermoplastic materials. Product engineers can literally design the performance characteristics (tensile and impact strength, dimensional stability, thermal stability, etc.) of a finished part, knowing that a long fiber reinforced material can be engineered to deliver the specific desired mechanical performance to meet their application needs. The production of high-quality injection molded parts requires knowledge of the molding process, skill and careful attention to startup details, and consistent management of the process throughout the entire production run. 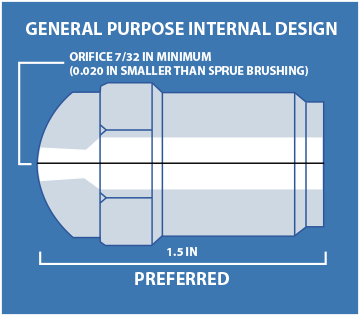 The resulting performance properties of a molded part can be degraded as a result of inadequate preparation and monitoring of all elements of the molding process. With good preparation and process management, quality parts will result and rejects and waste will be reduced. Proper material storage, handling, drying and machine feed conditions must be maintained in order to ensure consistency in the manufacturing of high quality injection molded parts. Always store Complēt materials in a warm, dry location. Cold temperatures encourage condensation on packaging and pellets while warm, moist conditions cause polymer moisture absorption. Internal (for hygroscopic material) and external (for non-hygroscopic material) pellet moisture levels are a common cause of both process and part quality problems. Further, high moisture content in the polymer can degrade the property performance of certain materials. Proper drying of materials is essential for molding quality parts. Drying time and temperature will vary depending upon the specific polymer being used. Please refer to the process conditions for specific drying time and temperature for all Complēt materials. Do not attempt to dry the material in an air circulating oven. A pneumatic material handling system has proven to be the best method for safe transfer of injection molding materials. Hose and auger systems can also be used but have disadvantages of floor space requirements and interface to hoppers and dryers. Whether using a pneumatic or auger system, smooth inner walls on hoppers and transfer pipes, hoses and tubes are essential to minimize pellet damage. The overall objective during the molding of Complēt long fiber reinforced materials is to get the pellet from the hopper to the finished molded part with minimal reduction of the original fiber length. The many performance benefits of long fiber reinforced material can be reduced or lost through inattention to a careful machine setup and closely managed manufacturing process. Proper equipment settings, smooth flow and watchful process management are essential to the production of a molded part that features a perfect surface, correct color, dimensional accuracy and conforms in every way to design specifications. For details on processing Complēt composite pellets in polymers not listed contact PlastiComp technical support for assistance. Notice: The information contained in this guide is accurate to the best of our knowledge at the time of publication; however, we assume no liability whatsoever for the accuracy and completeness of such information. Further, the information and techniques presented in this guide are often simplifications and, therefore, should not be relied upon for any particular use. Independent analysis and prototype testing under the harshest conditions likely to be encountered must be conducted to verify suitability of materials and satisfactory part performance. We make no representation or recommendation regarding suitability of processes or materials for any particular use. It is your responsibility to determine the suitability of processes and materials for your intended use and to ensure compliance with applicable health and safety standards. Material data and values included in this guide are based on sources deemed to be reliable and are believed to be representative. However, they are not intended for use in establishing values for specification purposes. Colorants or other additives may cause significant variation in data values. You should adhere to the manufacturer’s or supplier’s instructions for use and handling of materials. It is your responsibility to determine whether your use of any materials infringes any patent. To the extent that any hazards may have been mentioned in this guide, we neither suggest nor guarantee that such hazards are the only ones that exist. For further information, please refer to our website or call the numbers provided in this guide.